Production Data in the	Clouds	Record the production of any connected	Computer, Tablet with Internet. Simple and Efficient. Access Control by password. Know More! 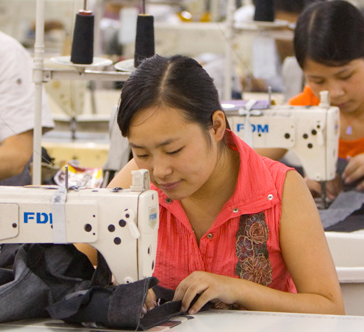 Follow your apparel production	Anywhere in	the World	Know More! Production Sequence reorganized. Immediately	Simply choose the Apparel Article, drag-and-drop, and the PracticalTex System will redo the work sequences at cutting, sewing and packaging sectors'. Know More! Create a dynamic screen of	WORKSTATION CELLS	Design the production cell with apparel articles and workers moving at the workstation, in the speed of production line leveling, respecting each operation time. Know More! 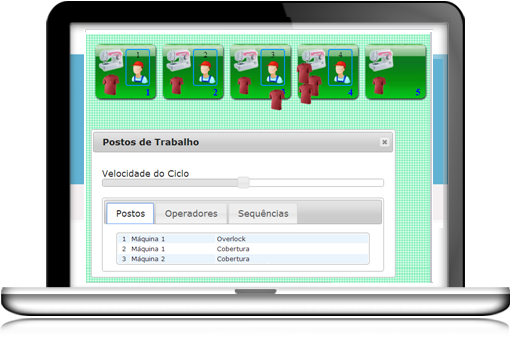 Leveling of production line, assembly production cell, Balanceamento de linha de produção, montagem de célula de produção, determine the ideal production batch and create productive goals per production cell team. Consuption explosion of fabric and accessories at right momento of production order creation, with quatities of fabric per weight and running meters and the stock position of raw material. Suggest the best sewing machine sequence and even which the best seamstress for each work station. Use PracticalTex as a tool to online monitoring the production of fashion goods, where delivery time, quality and pay attention into the details is extremely crucial. You can movie the expert dressmaker running the complex sewing operation and after this upload the vídeo join with operation recorda at online databank. Be in touch with your favority social net!